Dead Car Battery? Here's How to Jump Start It! - Hegarty-Haynes Insurance, Inc.Hegarty-Haynes Insurance, Inc.	Dead Car Battery? Here's How to Jump Start It! 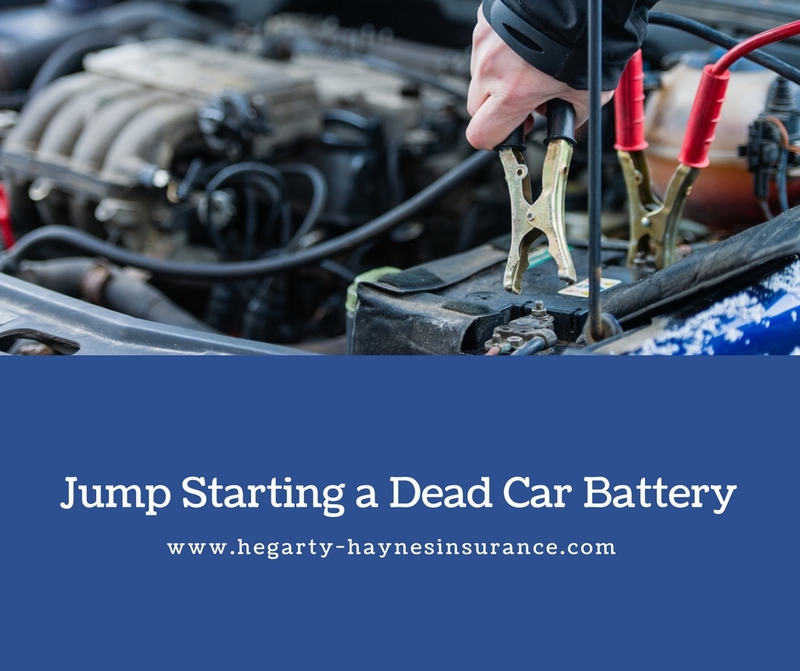 - Hegarty-Haynes Insurance, Inc.
You should always keep jumper cables (also called booster cables) in the trunk of your car. Available in varying lengths, 12 to 25 feet, jumper cables can really come in handy in the event of a weak or dead battery. You can also purchase a portable jump start instead, or in combination, of jump cables. Follow these steps to jump start a dead car battery. Step 1: Position the functioning car as close as possible to the vehicle with a dead battery. Nose-to-nose tends to work best. Turn off the engines, removing the keys, and open the hood to both cars. Locate the batteries and remove any plastic coverings. Step 2: Attach the red, positive cable clamp to the positive (+) terminal of the dead battery. Ensure you have a solid connection to the terminal by wiggling the clamps. Connect the other red end to the functioning vehicle’s positive (+) terminal. Step 3: Attach the black, negative cable clamp to the live battery’s negative (-) terminal. Connect the black, negative cable clamp to an unpainted, metal part of the stalled car. This “grounds” it, ensuring a safe jump. Step 4: Start the booster car. Step 5: After five minutes have passed, try starting the vehicle with a dead battery. If the car doesn’t start, you can try waiting a few more minutes, or revving the engine of the working car. That should do the trick. Step 6: Once the stalled car is running, disconnect the jumper cables, starting with the black (-) cable clamps on the stalled vehicle and then the working vehicle. The red (+) cable clamps should be disconnected last. Be careful not to let the jumper cables touch. Step 7: Take a short, 30-minute drive, allowing the battery to build up a charge. This entry was posted in Auto Insurance, Road Side Assistance, Safe Driving. Bookmark the permalink.